Hello friends, today’s blog post will be a bit different from what I usually post and I will be sharing a subscription box service that caters to those who are interested in both K-Beauty & K-Skincare. This was box was kindly gifted to me for me to try, review and share this amazing service with you all! 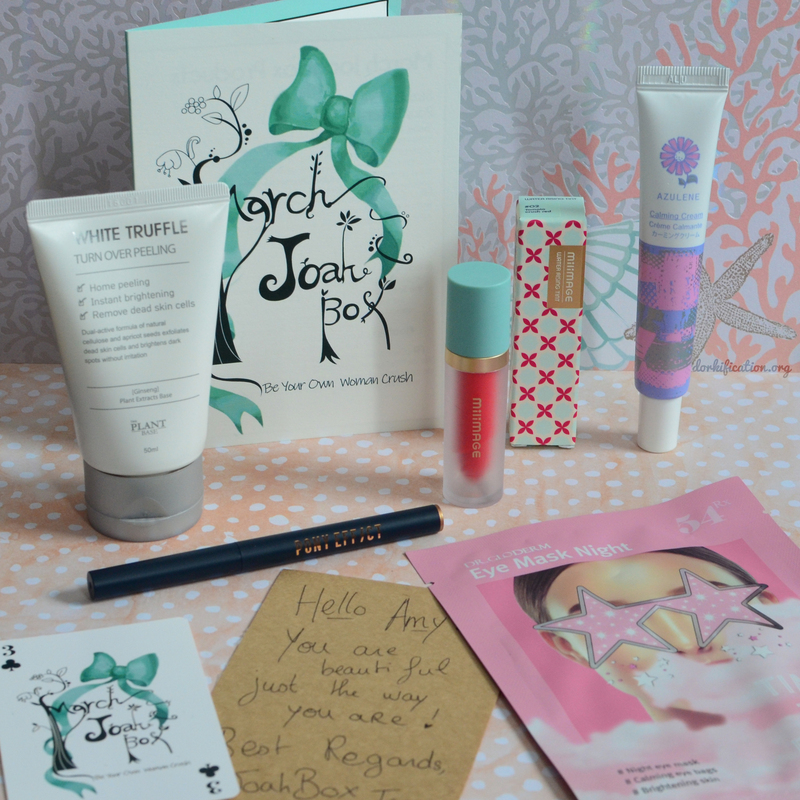 This is a K-Beauty and K-Skincare subscription box service that allows you to try out new products. Each month, those who are subscribed to this service will receive 5-7 full-size products and they can value up to $60-$100; there are lots of well-known K-Beauty brands and also some indie brands as well. How awesome is that? Also, when you share your JoahBox with your family and friends on social media, you will get a chance to win an extra product in your JoahBox. Who doesn’t love freebies? Let’s take a closer look at the box! The original service use to give out boxes but now they switched to pouches inside. I actually like the pouches a lot more because they’re travel-friendly and can be re-used. Let’s take a moment and appreciate how adorable everything is! Every box, an information card is included with a gorgeous illustration along with a beautiful customized card. The card resembles a card you could find in a deck of cards. I personally find these little details really make this subscription service stand out. This is a water-based lip tint that is rich in pigment and also provides beneficial moisture onto the lips. It is a hybrid gloss x tint product and has a lightweight water-like texture feeling. There is absolutely no stickiness to this and is long-wearing. The packaging for this is absolutely adorable and looks fun! On the outside, it has the appearance of lipstick inside a frosted container but turns out, it has a doe foot applicator inside. Joah Tip: Apply a suitable amount on lips from center to outwards. Adjust the number of layers to create the colour you desire. Azulene a fantastic ingredient that carries healing properties and is extracted from chamomile; it is also a potent anti-inflammatory and provides the skin rapid relief and reducing the appearance of redness. This cream has calming, soothing and balancing properties. How To Use: Use once to twice a week or whenever you have skin inflammation or irritation. This is a mild physical exfoliant and has a dual-active formula of natural cellulose and apricot seeds to exfoliate dead skin cells and brighten dark spots without any skin irritation. It is formulated with Ginseng and White Truffle. Also, this product is cruelty-free, hypo-allergenic and uses plant extracts, roots and etc. This sounds like an awesome product! This is a gel-based formula eyeshadow stick that allows you slide, glide and blend this effortlessly. It’s also smudge-free! This is a metallic bronze colour and is perfect for everyday wear! I’ve tried a handful of eyeshadow sticks and this one is really comparable to the Laura Mercier ones but for a fraction of the cost! This is a hydro-gel mask that provides hydration and an amazing cooling effect on the skin while brightening the skin! If you subscribed to February’s box, be sure to use the jelly mist prior to the sheet mask for full cooling and calming results. Apply this mask and leave it on for 20 minutes, be sure to pat the remaining essence until fully absorbed onto the skin. Overall, I think this box is worth its value, there were two familiar brands. I knew of pony effect along with milimage, the rest were new brands to me but I thought it was a fantastic experience since there were new brands in this box and it’s an excellent way to experiment and try new products! I also forgot to include the Commleaf Surely Green 100 Face Oil Mini and it was a sample size and the value is $4. I already own the full size of this product and absolutely adore it! The total value of my box was: $63! That’s pretty much like double of what you pay for the box. I think it’s a great deal and worth a shot if you’re interested in trying out new K-Beauty products. Hello friends! It has been a long while since my last blog post and I have been quite occupied with life along with my struggles of protecting my moisture barrier. Luckily for me, winter in Canada is almost all over. I wanted to share a product I have been using for almost 2 months behind the scenes. I received this cream back in early February and wanted to give this cream some time to see results. This cream was designed to firm skin barrier, recover damage skin, soothe, provides scar and pore care. 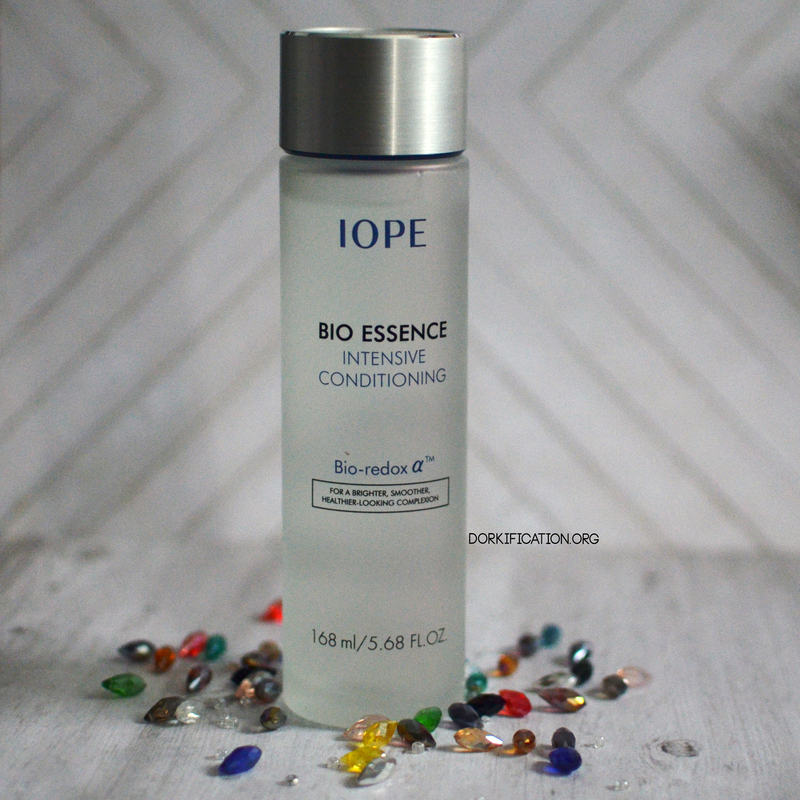 It has a high potency is Centella Asiatic content (700,000ppm) and enriched 4 kinds of cica extracts (Asiatic acid, Madecassic acid, Asiatic acid, Madecassoside) to protect damaged skin barrier. There is also tea tree leaf extract (anti-oxidant), adenosine (wrinkle-care) and niacinamide (whitening/brightening). What is AHA, BHA, and PHA? Before we talk about the ingredients and the product breakdown, I want to share a break down of what AHA, BHA, PHA are because I know they can get confusing and even myself get them mixed up. AHAs are used to reduce the appearance of hyperpigmentation – dark spots, scars, enlarged pores and uneven skin tone. This is excellent for penetrating deeply into the skin and removing excess dead skin cells and surfacing the skin. You may have seen them in your skincare’s ingredients before. A very common one is Glycolic acid; this acid is derived from fruit extracts and even sugar cane. Another AHA is Lactic acid and unlike most AHAs that are derived from fruits, this one is made from lactose in milk. It’s also known to reduce the effects of aging. Whatever kind you decide to use, please be advised to wear sunscreen every day to prevent age spots, skin irritation, and burns. BHAs are meant to be applied a few times during the week until your skin adapts to its effects. BHAs do not sensitize the skin like AHAs do but please be sure to wear sunscreen every day to prevent any further sun damage. A very common BHA that you may already use in your skincare routine is Salicylic acid. This is a common ingredient used to treat acne and also calm skin’s redness and inflammation. This is more suited for oilier skin types. PHAs are quite similar to AHAs however they are much milder. This is usually for those who have more sensitive skin types who can tolerate neither AHAs and BHAs and is an exceptional alternative. PHAs can help smooth and resurface the skin without any skin irritation. Centella Asiatica Extract (Cica): is a plant-based ingredient that has multiple healing properties. The extract is rich with amino acids, fatty acids and etc that can help treat and prevent acne, calming down skin inflammation and promote collagen growth. Aloe Barbadensis Leaf Extract is an antiseptic and a moisturizer. Aloe is known to soothe act against inflammation and is clinically proven to heal burns, wounds, and scars. Madecassic acid is an antioxidant and helps replenish the skin’s surface. The first thing I noticed about this product’s ingredients was that the first ingredient listed is Centella Asiatica Extract. This means the potency of this ingredient is very concentrated. I swear by this ingredient and use this on a regular daily basis – it’s one of my favourites for countering skin irritation and redness. I see a huge significant difference when using products with this specific ingredient. The texture of this cream is a gel and has a very pleasant cica, fresh scent to it. The moment I applied this onto my skin, it instantly felt hydrated, moisturized and cool! I did not refrigerate this product but if I did, I bet it would be even more cooling. I noticed the appearance of my skin looked brighter and more even after using this cream. Texture: 5/5 – I love gel creams, they’re not ideal for me during winter but I’ve been using a lot more facial oils on my skin so it all works out. I am very thankful to know this cream does not pill nor is it sticky. It absorbs seamlessly into my skin without any issues. Scent: 5/5 – There is a light cica scent to it and I absolutely adore it! If you’ve ever smelled cica products, they smell very pleasant to them. Price: 5/5 – This is pretty affordable for cream and will last you a while before you need a replenishment. It’s a lot more affordable many resurfacing creams in the market and would highly recommend you to give this a try. Performance: 4/5 – Absolutely fantastic! My skin definitely has improved from what it looked like since early February to today. It’s less textured and way brighter looking. My skin was going through multiple phases during winter and it was never consistent but I found myself reaching for this cream a lot as night care to resurface and restore my skin. The following morning after using this cream, my skin is soft to the touch and quite radiant! I have this healthy glow to my face. I also used this during when I had a few active breakouts and almost immediately after I applied this cream on, it had this amazing soothing sensation to it. After maybe about 3-4 consistent uses every night, my breakouts were practically diminished and no longer inflamed! Packaging: 5/5 – Practical and easy to use. I prefer jar packaging over tubes because tubes are such a pain to get the excess product out when you’re almost done using it. Overall: 4/5 – This product is a beautiful product and definitely worth a shot trying. I find this is an effective cream and budget-friendly because it will last you a long time and user-friendly. Anyone who struggles with uneven skin or acne-prone skin really should try this product out. It’s quite mild and does the job for a reasonable price! I would definitely repurchase this along with their toner from this line! Alright, the reason why I jotted off 1 mark is that the name “miracle”. Yes, this is an effective product however there really isn’t a product out there that is a one-stop shop that will solve all of your skin care issues. Everyone has different skin concerns and we need to keep that in mind. You as the individual, need to be able to take care of your skin and be consistent with your routine. With consistency, you will see results! Overall, I would highly recommend this for you guys to give this a try if you have similar skin concerns like I do. 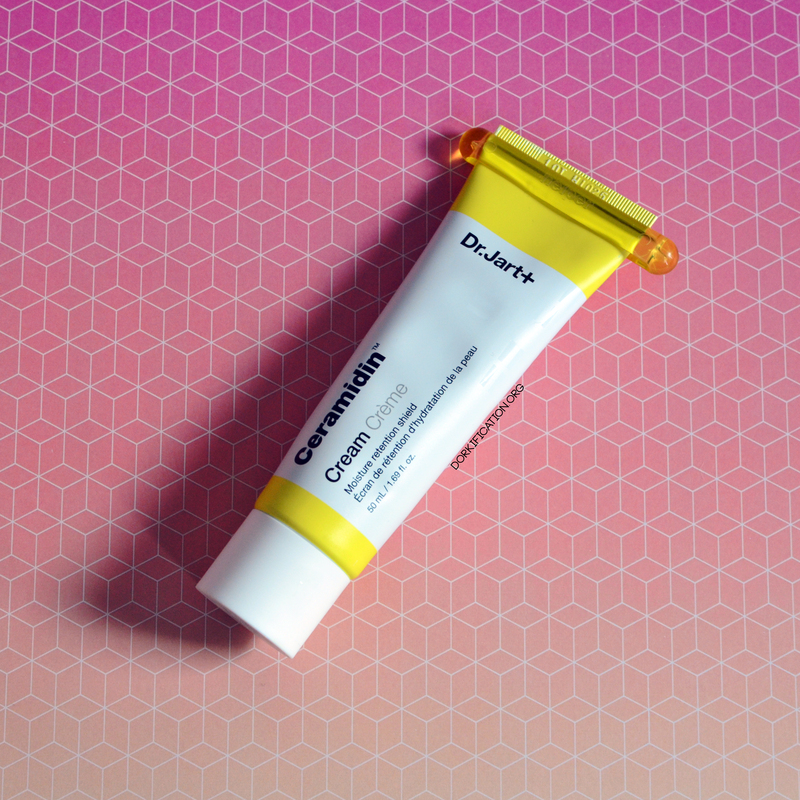 I hope this review helped you out on whether you would be interested in this cream, thank you for dropping by and have yourself a fantastic day! This product was kindly gifted to me in exchange for an honest review. All thoughts are my own. Good morning, my beautiful gems. I know I’ve been MIA but I’m back! I wanted to share a palette that I just received from my twinsie. Her name is Sharon and she is also known as @sherhearti on Instagram. Please check her out! Shades from left to right. There are no English shade names listed anywhere besides the Korean ones, so I’ll be describing the colours from left to right. #4 matte light milk coffee tone, perfect for a transition shade! #10 a bronze tone with sheen to it ~ this is beautiful and layers well! Tip: if you’re struggling to apply shadows in general and you don’t have a base to work with. Apply a concealer on your eyelids to prep your eyelids for eye shadow and they will appear more opaque and will last longer. This is what I did when I didn’t have an eye shadow base and works wonders. You can even use your foundation or bb cream to double up as a concealer and eye primer if you really wanted to! Texture: 3/5 – Maybe I am use to american/western types of eyeshadows but the texture of these shadows are dry feeling, tad powdery and the glitters have a grit feel to them. They apply beautifully with fingers. I prefer to apply k-beauty eyeshadows with my fingers rather than using brushes. Scent: 5/5 – No detectable scent, there are some eyeshadows in the market that have scents to them, which I don’t mind however it can be irritating those who are sensitive to fragrance. Price: 5/5 – Etude house eyeshadows are relatively affordable. Their singles range between 3-7 dollars. Their palettes consists of 10 shades and range between 15-20 dollars varying where you decide to purchase it. Performance: 5/5 – These are really long-wearing eyeshadows. I can get away without using a base and they will stay last on my eyelids. I don’t have oily eyelids so that could be why they last so long. Packaging: 5/5 – C’mon now! It’s etude house, they’re known for their iconic adorable packaging. I absolutely love their design for their packaging. Overall: 4/5 – It’s a good palette for those who are interested in trying out purple but doesn’t really want to commit to using all purple on their lid. There’s a good colour story and range of colours from duo chromatic, shimmer, glitter and mattes for transition. Until next time, friends! 🙂 I’ll be back soon with more skincare reviews. Please let me know if you enjoy these swatch posts. Disclosure: Some of the links stated are affiliate links.